The 20th of March 2004 marked a year since America and her allies went against the wishes of the whole world to attack the sovereign rights of a hapless country. There was a soothsayer who warned Julius Caesar ' Beware the Ides of March. Though there were many like him in the 21st century to warn America of what her actions of 20th March 2003 might unleash upon the world, she did not listen, anymore than Caesar did. 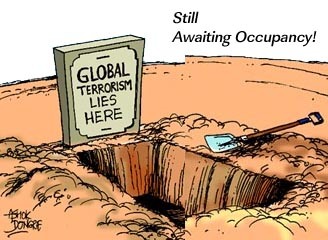 Has the world become safer after September 11th when the War against Terrorism was put into operation, America-style? Quite the contrary! Post 9/11 happenings across the world are a clear indicator that America has wound up creating hundreds of Osamas as the Egyptian leader, Hosni Mubarak so accurately predicted. From the Bali bombings, to the attacks on Western establishments in Turkey, Saudi Arabia and Pakistan, to the most recent train bombings on March 11th in Spain, the whole world has started feeling the impact of America's unilateral actions. America and its allies have been extremely shaken by the defeat of their compatriot, Jose Maria Aznar of Spain, after the Madrid bombings, and have critiqued the outcome of the elections. George Bush has gone to the extent of saying that terrorists should not be given a say in shaping the events of the world. It is often very hard to differentiate between the actions of America and those of the terrorists. America has defied the sovereign rights of two countries, Afghanistan and Iraq, and destroyed the lives of thousands of people in the process. All in search of two people, the still elusive Osama and Mullah Omar in Afghanistan, and the non-existent Weapons of Mass Destruction in Iraq. It would be good to remember that both Osama and Saddam Hussein were Frankenstein's monsters created and armed by America to serve its own selfish ends, then against the Soviet Union and Iran. The US administration has proved time and again that it has stood for its own selfish interests across the world. It continues to tacitly support Israel (how about all the WMD that it has armed this country with, against Palestine), has recently interfered in Haiti and has given a jolt to the peace-building efforts between India and Pakistan by Colin Powell's recent announcement that Pakistan will be a major non-NATO ally. This means that weapons like the sale of F-16 fighter planes (their sale had been stopped earlier because of a strong protest from India) can be a possibility in the future. All this has happened after the discovery of Dr. A.Q. Khan's selling of military secrets to countries inimical to America! The American administration seems to feel that the most important need now is to use America's help in capturing Al Quaida terrorists to serve a political interest. If the big fish like Osama are netted before the US Presidential elections, George Bush is sure to have a cakewalk! Who cares if Pakistan is armed against India? After all for a government that gets a lot of its financial support from gun running corporations, war is big business. So on the one hand it talks peace while on the other it supports war! A clear case of double speak, which the Red Indians understood a long time ago when they said White man speaks with forked tongue! The attack on Iraq had several purposes: to deflect from the lack of success with capturing Osama, control the oil and redraw the geo-political map of West Asia. The anarchy that has become the fate of this country is heart-rending. While the deaths from resistance forces in Iraq are quickly declared, the people of the world are yet to get the figures of the innocents who perished during the carpet bombings of Afghanistan and Iraq. What is this if not terrorism? The Spanish people have been accused of being cowardly for voting out America's keen ally but nobody has tried to understand the terror that might have been behind the election of a Socialist government. While one theory states that the Spanish electorate wanted to punish Aznar for lying that it was ETA that was behind the bombings, it could also have been a reply to him for supporting the war, when 90 per cent of the Spaniards did not want it. Spain's new leader who opposed the war has talked of withdrawing its strength of 1500 troops from Iraq, if the United Nations does not have a say there. This has sent panic signals across the American administration. In an election year, they would rather use the soldiers of other countries as cannon fodder, than have body bags that might cost George Bush his second term as President. Another example of extreme callousness! You defy world opinion to attack a country and then ask the people of the world to help out with their soldiers to police it, so that American soldiers can be pulled out slowly. Thankfully for an election year in India or else the right-wing government would have willingly sent soldiers to die for someone else's war, just to please the world's only super power. It would have been nice if wars could be fought like in the days of the Mahabharata when the Commander-in-Chief had to lead from the front, instead of having a whole slew of people to die for you while you give orders from a haven far-removed from the horrors. Ever since their attacks on Afghanistan and Iraq, the American administration has become paranoid about security, raising the alert several times. Many flights between the UK and USA have been cancelled during the holiday season and after. It is time now for paranoia in Britain with surveillance cameras coming up over Parliament ever since the bombings in Madrid. The politicians will of course take care of their own interests first but what about the security of innocent people who are at the receiving end always? Tony Blair went against the majority of Brits to support this war and now it is his turn to sweat despite the brave speech on terrorism that he made barely a few weeks ago at a party meeting. So, who is safe? Nobody in the world it appears, after the war against terror was unleashed. Dr. Krishna Kumar, a scholar and academic, rightly drew a parallel to the Nursery Rhyme, 'Ring-a-ring o' roses' where the last line says, All fall down! He predicts that not only will America go down but will take the rest of the world with them.